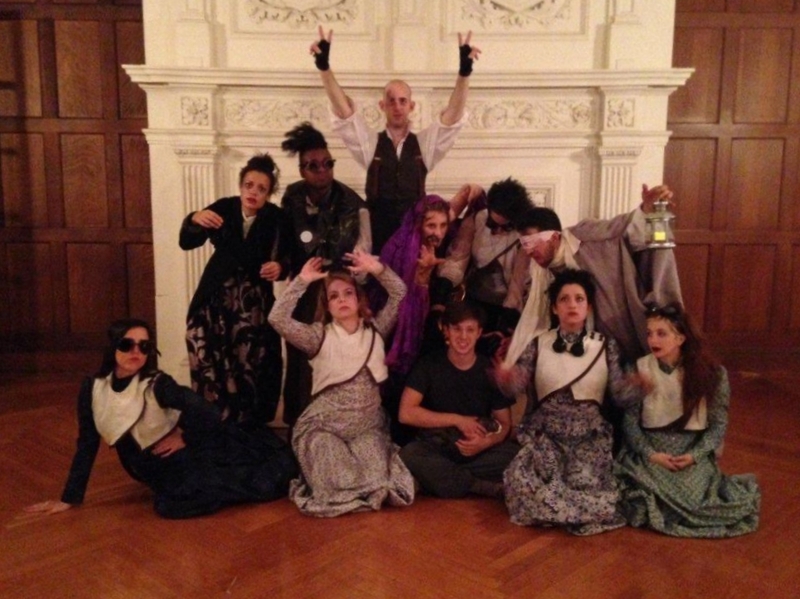 "The Medium Manifesto" performed for Goddard College's Alternative Media Conference. 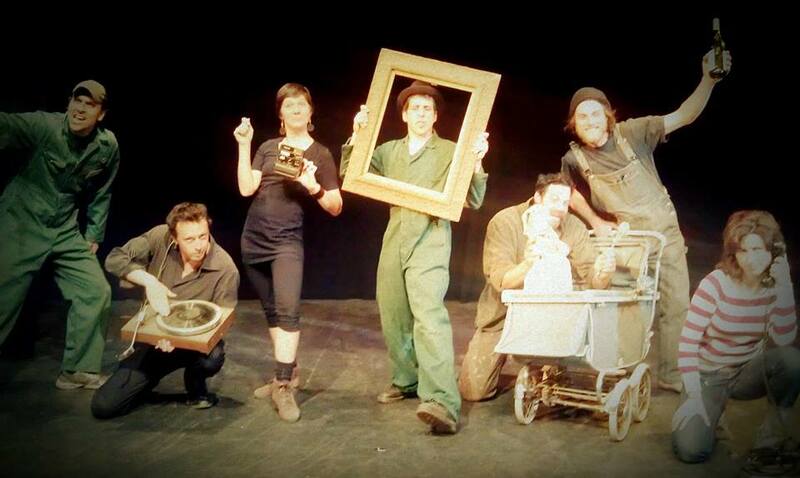 L-R: Ben T. Matchstick, Ben Altshire, Trish Denton, Morgan FitzPatrick Andrews, Adam Cook, Erok, Cathleen Carr. Hall of Haunts, 2013. Back: Ruby .. Voyager, Ky Metler, Morgan FitzPatrick Andrews, Rebecca Kanach, Vincent R. Abbot, Magdalena San Millan, Chelsea Murphy, Dana Haberern. Front: Mason Rosenthal, Marcia Ferguson, Xtn Hansen. Cast for The Sea of Tranquility Daniel McNamara, Alie Vidich, Morgan FitzPatrick Andrews, Dana Haberern, Sarah Gladwin Camp, Stephen Dahmer, Mason Rosenthal. Cast for Meet the Mediums: Dana Haberern, Kimya Imani Jackson, Sarah Gladwin Camp, Dorie Byrne, Morgan FitzPatrick Andrews, Mason Rosenthal. The Medium Theatre Company came together in Philadelphia as a group of artists with backgrounds in music, dance, theatre, puppetry and design, all eager to work interdisciplinarily. In March of 2012 a 7-member ensemble debuted The Sea of Tranquility, a site-specific play commissioned by Rutherfurd Hall in Allamuchy, New Jersey. 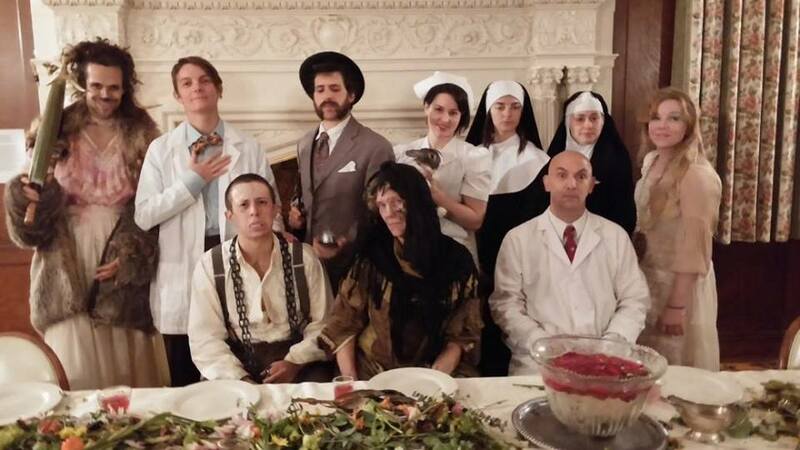 The company has since returned as an dozen-person ensemble to perform other original plays and an annual Halloween show in the Rutherfurd mansion. In 2015 the Mediums premiered their Halloween show in Philadelphia and are currently touring two solo shows: a stage performance called CONES, and the bedroom play Nobody's Home. In 2016 the company will explore some new directions and take on commissions for new site-specific works—Stay tuned! Morgan FitzPatrick Andrews and Mason Rosenthal are the two active members of the Medium Theatre Company. Since 2011 the two have worked on a dozen plays together, including 10 original works as Mediums. Mason is currently pursuing an MFA in Austin, TX and has this website that documents all of his doings. Morgan already found his MFA in Vermont and lives in Philadelphia where he's building this website to catalogue his own happenings.